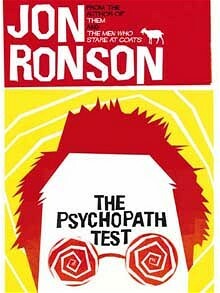 Retro Review: Jon Ronson's "The Psychopath Test"
Home » books » retro review » Retro Review: Jon Ronson's "The Psychopath Test"
I dug up this title as we were packing up the wayward piles of books in our office in preparation of moving. Maybe it says something about me, that I would immediately be drawn to a book entitled The Psychopath Test, or perhaps I shouldn't dwell on it. As soon as I saw that it was by the same man who penned The Men Who Stare At Goats, I couldn't help stowing it away in my bag. Jon Ronson's book is an interesting insight into the madness industry. He delves into the characteristics that are used to define psychopaths, and meets some interesting people along the way; criminals, scientologists, psychologists, and corporate CEOs, to name but a few. All this is played humourously against the author's own neurotic sensibilities. What the reader is left with, is a fascinating (and often amusing) examination of some of the quirky experiments that went towards defining the modern psychopath. Aside from the fun of trying to spot psychopaths amongst the people you know, this book is a fascinating exploration of madness in many of its forms. What quickly becomes clear is that using a list of attributes to diagnose psychological disorders has got out of hand in recent years, a fact with which I couldn't agree more. Particuarly in the US, the tendency to diagnose children with conditions such as bipolar disorder has become a real problem, though when you have pharmaceutical companies waiting in the wings to sell drugs to anyone and everyone, the reason this is happening becomes infinitely more clear. Ronson deftly questions what the division between acceptable madness and unacceptable madness is, with his look into modern media, and the need to put 'entertaining' people on reality television shows. This examination should make you evaluate why you enjoy watching these shows (if you do). For anyone interested in the workings of the human mind, this is well worth a read. Sounds very interesting, Kate. I suspect you are right about the pharmaceutical companies. Absolutely not! You're far too compassionate to be a psychopath. I can lend it to you if you fancy reading it.